Maybe just this relaxed atmosphere was the ideal breeding ground for developing something special. After a short time they already noticed how easily they could communicate. Each one payed attention to the other and all together played on the same wavelength. 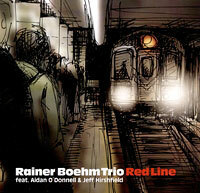 With the compositions of Rainer Böhm they developed a very individual sound, characterized by expressiveness, strong melody lines, clarity, interaction and dynamics. The musicians didn´t want to boost their egos but to play together and to express emotions. Finally this sound was n´t made to be locked in a studio. Also the surrounding should be carried away by their playing enthusiasm. So in summer 2008 the three musicians from Germany, Scotland and the USA produced the first CD in New York, in one of the most famous sound studios of the world, the „Systems Two“. world-wide renowned player: he worked, among others, with Zoot Sims, Clark Terry, Mose Allison, Woody Herman, John Abercrombie, Randy Brecker, Eliane Elias, Jim Hall and John Zorn. In 2009/2010 release tours are planned in Germany, Scotland and the USA.